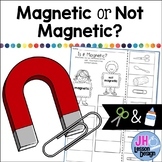 This a great group activity to do with your class to test which items are magnetic and which are not. My class had so much predicting which items were magnetic and testing out their predictions. This activity provides a fun, engaging, and meaningful way to review magnetism. Students will cut out examples of magnetic and non magnetic items and glue them in the correct column. Answer key included. This lab is the perfect introductory lesson to magnetism. Students predict whether common items are magnetic or not. Then they test the items using a magnet. This science lab activity is a fun and quick way to introduce magnets to your students! Students begin by investigating magnetic poles and then make a hypothesis and test whether different objects are magnetic or not. This lab activity is easily adaptable for students of all ages! This is a worksheet for students to do for homework or in the classroom. 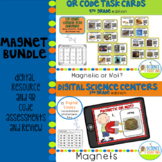 It can be built into almost any magnet lesson plan, however ti is best to use after students have already experimented with magnets and different objects. With this template student can discover what materials will be magnetic or not? Great to do after showing Bill Nye's video on magnets! Magnetism Activity- Magnetic or Not? Magnetism Activity: Are more things magnetic or not? This product contains two sets of 42 clip cards. In level 1, students match the magnetic or non-magnetic image. In level 2, students at the image on the card and determine whether it is magnetic or non-magnetic. Students indicate their answer by pointing, using clothespins or a dry erase marker. Science QR Code Science Review Magnetic or Not? You could use this as a pre and a post assessment for magnetism. The students will sort pictures to magnetic or non magnetic then they will sort words. It also includes instructions for students. Students can work in small groups with each object. They will test each one with a magnet and record their answer in the correct column. This activity contains ten pages. Students will sort items based on whether or not they are magnetic. Just laminate, Velcro, and you’re good to go! Sorting pictures into the correct categories.